Everyone knows that Florida is one of the best places in the world when it comes to beaches, sunbathing, water sports, and all the other classic coastal activities, with the Sunshine State enjoying warm weather and more miles of coastline than any other contiguous state. Of all the world class beach cities and destinations around Florida, Clearwater is arguably the best known and most popular. Situated in Pinellas County on the Gulf Coast, in the northern part of the Tampa Bay area, Clearwater is home to over 115,000 people and stretches out across more than 35 square miles. The city is home to the global HQ of the Church of Scientology, as well as various unique and interesting attractions like the Clearwater Marine Aquarium, but is best known for its astonishing white sand beaches. Often ranked as one of the very best beaches in the entire United States and frequently entering top ten lists of best beaches on the planet from many travel experts, Clearwater Beach is well known for its exceptionally, soft, white, sugary sands and warm, turquoise waters. The local area is fitted with fishing piers, surf shops, attractions, resorts, and more, with Clearwater also offering easy access to other awesome beaches like Honeymoon Island State Park and Caladesi Island. Clearwater, FL is the perfect spot for anyone who wants to spend some time relaxing on soft sands and soaking up the hot sun at any time of year, and is a must-visit location on any road trip or RV tour of the Sunshine State. There are several highly rated RV parks in Clearwater and the surrounding area for you to choose from on your next trip to the Florida coast. Read on to learn all about the best Clearwater RV parks. Ask any RV enthusiast for their favorite place to stay in the Clearwater, FL area, and there's a very good chance they'll mention the Clearwater RV Resort. Situated in the eastern side of the city, looking out onto the waters of Old Tampa Bay, this RV park has received countless exceptional reviews from past guests for its awesome facilities, wonderful customer service, and friendly atmosphere. It's only minutes away from all the best attractions and beaches of Clearwater, as well as offering easy access to other locations in the Tampa Bay area. Designed with both long and short term stays in mind, this RV park is fitted with many amenities and organized activities to help you enjoy a magical, memorable stay. The Clearwater RV Resort features highly spacious RV sites with concrete pads, private picnic tables, high speed wireless internet access, and all of the standard full hook-up services you would expect from a good quality RV park. On-site amenities include a swimming pool, shuffleboard court, horseshoe pits, overflow sites, a large recreation hall, a friendly welcome center, a laundry area with coin operated washers and dryers, a play area for the little ones, a BBQ and grill zone, multiple restrooms, and hot showers too. To make your stay even better and ensure you never get bored, the Clearwater RV Resort also offers organized games and activities to suit all ages. Perfectly placed in the heart of the city, only minutes away from awesome stores, great restaurants, and the world class sandy beaches of Clearwater, Avalon RV Resort is another amazing place to stay on this part of the Sunshine State coastline. Offering a warm welcome to all visitors and plenty of useful amenities too, this premier, luxury RV destination is so much better than a typical RV park and features highly affordable rates too. Daily stays at this Clearwater RV park start at just $43, with weekly stays costing $250 per week and monthly stays available for $575. The longer you stay, the better the price, with annual stays available for the monthly cost of just $366. On-site amenities at Avalon RV Resort include a heated swimming pool for fun and games with your friends, a shuffleboard court, private mailboxes, a community hall to meet up with other travelers, RV storage facilities, scenic landscaping, high speed Wi-Fi access, a clean bathhouse with toilets and showers, a large laundry area to keep all your clothes fresh and clean, and more. Pets are more than welcome at this excellent RV park, and lots of activities and games are organized all through the year to keep you entertained and ensure there's always something fun to look forward to. Some of the best RV parks in Clearwater are situated in the eastern side of the city, but if you want to be over on the western side, just a short walk away from the world class Clearwater Beach, West Bay Oaks Mobile Home & RV Park is a great option to choose. Located in Largo, this RV park is just a short walk or drive away from the soft, white sands that have helped Clearwater win so many best beach awards over the years. 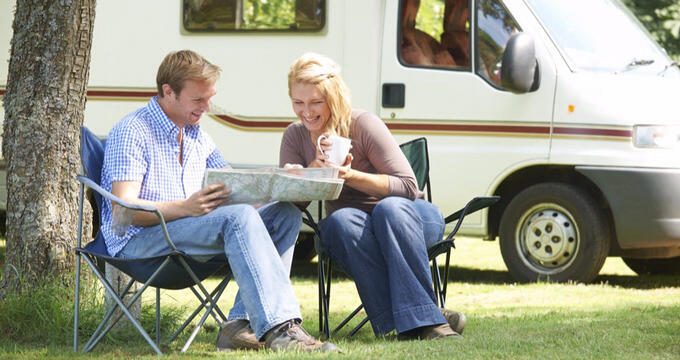 This RV park features plenty of spacious, full hook-up sites with plenty of useful amenities and facilities too. West Bay Oaks Mobile Home & RV Park is filled with beautiful oak trees, colorful plants, and nicely landscaped grounds to provide a scenic setting for your stay. It offers a highly peaceful and relaxing environment where you can really feel a million miles away from city life. On-site amenities at this RV park include a laundry area with coin operated machines, clean restrooms, great quality showers, a picnic pavilion with a food prep area, private mailboxes at each RV space, and high speed Wi-Fi hotspots. You'll also find a big rec hall on-site and plenty of fun activities are organized in the hall like bingo, parties, dinners, and craft sessions.